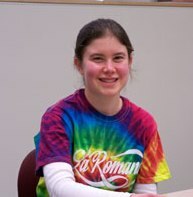 Sarah Gross is Falvey Memorial Library’s student employee of the month for February 2012. Sarah, a junior nursing major from Rockville, Md., is executive vice president of the campus Student Nurses Association of Pennsylvania (SNAP-Villanova). As part of her activities with SNAP, Sarah chaired the on-campus Dream for Eileen event. The Dream for Eileen 5k Run/Walk commemorates nursing student, Eileen Shea Lupton ’03 CON, who died before she could begin her first job after graduation. Dream for Eileen raises money for nursing student scholarships. Sarah also worked with the Andy Tally Bone Marrow Donor Drive, and coordinates SNAP-Villanova’s vision screenings at the McDaniel Elementary School in Philadelphia. In addition to her SNAP-Villanova activities, Sarah plays the bassoon in the Villanova University Orchestra. Last summer Sarah worked on an oncology floor at Georgetown University Hospital, Washington, D.C., and this summer she will work there on a pediatric transplant floor. Congratulations, Sarah! We’re sure fortunate to have a capable, generous, effervescent student like you!